Anti-mildew, moth, anti-bacterial, anti-fouling, landscaping decoration, moisture, anti-static. The product you received contains 2 parts.This item is a DIY product.It should be put together by yourself.The product is only suitable for smooth media,such as Glass,metal,dust-free walls and so on. 2.Position the adhesive on a plane surface without pressing them, so that it let's possibility to withdraw them and reposition again,if needed. 3.If the result is satisfactory for you, stick firmly to the surface pressing the air bubbles outwards. 4.If you have bubbles, take a needle to bore them. 5.Clean the smooth surface before sticking it on. 1.Because the sticker is big, so we will ship it roll up with Anti-pressure bubble. Thanks. 2.There may be some wrinkles on the sides of the sticker due to international shipping, but it don't influence the decor effect on the wall,please know this in advance,thanks! 3.This product is designed and sold exclusively by iPrint. Only buy from iPrint to get genuine iPrint products with manufacturer warranty and superb customer service. Important Note:this is custom order,pls send us the size you need.In order to provide an easy installation,1 Set Door Decal includes 2 half pcs size 15.15"Wx78.74"L, stitching together whole size is 30.3"Wx78.74"L.100% Brand New And Highest quality vinyl. Material is eco-friendly and our vinyl stickers are perfectly removable and no residue. Our door decal can lasts up to 5 years, which also will not damage walls or surfaces. Just peel and stick this door decal, it will be a calm and exotic landscape in your room. This is a set of DIY door decal, which can be put together by yourself. You can choose wherever you want to make a decoration, just a easy thing for you. 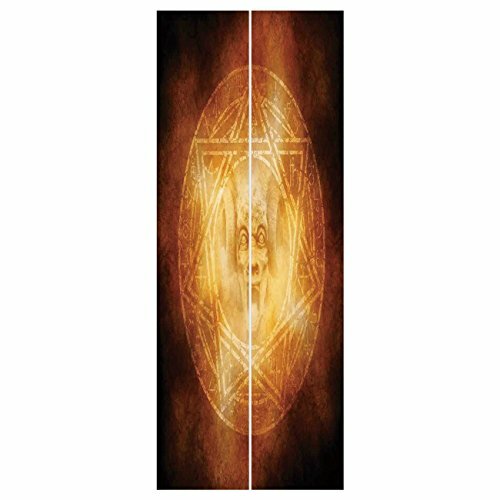 The door mural is only suitable for smooth media such as Glass, metal, dust-free walls and so on. NOT suitable for dirty or rough surface. Pls note to clean the surface before you paste it. View More In Home Décor Accents. "I love the paranormal, because there,..." quote by Leslie Banks, laser engraved on wooden plaque - Size: 8"x10"